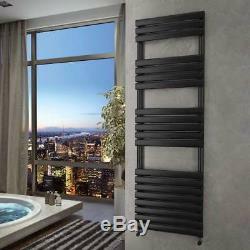 HB Signature Omega Black Designer Heated Towel Rails. Central heating, Dual Fuel and Electric only options available for every size. Manufactured in accordance with BS EN 442. Supplied with wall mounting brackets and fixings. Towel rails are moving out of the bathroom and taking up residence in other living spaces as functional yet stylish alternatives to radiators. This ultra-modern black version from Omega takes that to the next level, creating an eye-catching interior design feature that's as practical as it is elegant. Crafted from steel, its super-smooth, powder painted surface looks fabulous, and also helps to radiate the heat throughout your room evenly. And at an affordable price, this is designer chic on a budget without the usual high price tag, so everyone can have a little luxury in their lives. The towel rail performs beautifully too. It is CE approved and guaranteed for five years, giving you total peace of mind. It's also EN442 certified, so the advertised heat output is exactly what you can expect this premium quality rail, no matter which size you choose. The Omega design incorporates larger steel tubing, creating a larger surface area and so radiating more heat. And because the tubes are thicker there is less chance of leaks or corrosion. Don't hide this smart towel rail in the bathroom - unleash it in any living space to create a'statement feature' in any living space, commercial or retail setting. Range of standard and thermostatic valves available separately. Central Heating, Dual Fuel or Electric only - Explained! Central Heating - A central heating Radiator or Towel Rail is heated using your central heating system. The most important part of this system - for your Radiator/Towel Rail - is the boiler, and you most likely have one in your kitchen or bathroom. Electric Only - An Electric Only Radiator or Towel Rail is filled with a heat conducting liquid, this could be oil, or a water based. Working with your home's electricity supply, with the benefit of not needing to be plumbed into your central heating system, a Thermostatic or Non-Thermostatic element is attached to the Radiator or towel rail and this is what controls its heat. You will need to have these Radiators/Towel Rails installed by a qualified Electrician. Dual Fuel - A Dual Fuel Radiator or Towel Rail is a combination of both the Central Heating and Electric Only versions. A Dual Fuel Radiator/Towel Rail is not filled with any liquid like the Electric Only, because it is made to be plumbed into your Central Heating System, which will be the source of its heat when the Central Heating System is turned on. When the Central Heating System of your house is turned off you can use an Electric Element (Thermostatic or Non-Thermostatic) to heat the Radiator/Towel Rail. Towel Rail Wall to Pipe Centres. Please allow extra time if you are paying by cheque. Or you can collect from us. This means that you do not have to wait in until your goods arrive. We therefore respectfully ask that you do not arrange for a plumber or other tradesperson to fit your goods until you have received and checked your order. We cannot be held responsible for wasted tradesperson visits and charges incurred as a result. SPECIAL ARRANGEMENTS FOR COURIER DELIVERIES. When your order arrives, you will be asked to sign to say that you have received the goods and that they are in good condition. Please check both the external packaging and the product inside for any damage. We will arrange for a replacement item to be delivered to you as soon as possible, at which time the damaged item will be collected and taken away by the driver. SPECIAL ARRANGEMENTS FOR PALLET DELIVERIES. The drivers are only insured to deliver goods to the curb and are not required to carry goods into your home. If you find any damage, please sign the pallet as'DAMAGED' and the driver will take the damaged pallet away. If you are having multiple items delivered and only some are damaged, please sign'DAMAGED' for the goods that are damaged. If someone else will be signing for your goods. If someone else is signing for the goods on your behalf, you agree to ensure that your nominated signatory checks the goods prior to acceptance. Choosing the right accessories for your new Radiator or Towel Rail. The type of valves that you need will depend on the configuration of your pipework. If the towel rail / radiator has connections at the bottom. You will need either angled or straight valves. Angled if your pipes are coming from the wall as this will provide a 90 degree angle up into the bottom of the towel rail / radiator, straight if your pipes are coming from the floor and just need to go straight up into the bottom of the towel rail / radiator. If the towel rail / radiator has connections at the sides. The item "Black Heated Towel Rails Designer Bathroom Radiator Matte 5 Year Guarantee" is in sale since Tuesday, November 14, 2017. This item is in the category "Home, Furniture & DIY\Bath\Towel Rails".